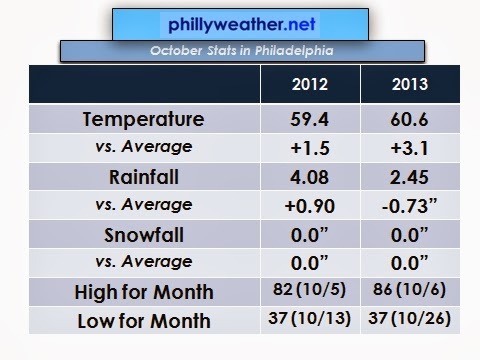 The warmest October since 2007 brought temperatures 3.1 degrees above average to Philadelphia. Not only was October mild, it was relatively dry as the city only picked up 2.45" of rain during the month, with the bulk of the rain (2.03") falling in a three day window around the mid-month coastal storm. This October was among the 15 warmest Octobers we have had since the 1870's and the fifth warmest in the last 30 years. You can thank that very warm start we had the first week of the month as temperatures pushed into the mid to upper 80's (depending on location) for five straight days and exceeded 80 on seven straight occasions. After a front passed through on October 7th, the region actually averaged less than one degree above average for the balance of October. However, that first seven day window provided such a significant warm anomaly that the region's temperatures ended up over three degrees above where they should be. Rainfall was above average at the Shore -- Atlantic City picked up nearly five inches of rain during October, much of it from the midmonth coastal -- as well as in Sussex County, Delaware. Temperatures generally ended up in the two to three degree above average range regionwide.